Tulane is the fifteenth oldest medical school in the United States, but that does not mean we are stuck in our ways as an organization, far from it. Probably the best example of this is the Tulane Center for Advanced Medical Simulation & Team Training, which was founded in January of 2009. In the nearly ten years since the simulation center launched, technology has changed immeasurably, and we have made an effort to change right along with it. Staying ahead of the curve is always critical, because our job is to create forward-thinking simulations for our students. In the beginning, we were heavily reliant on the demonstration model of training. 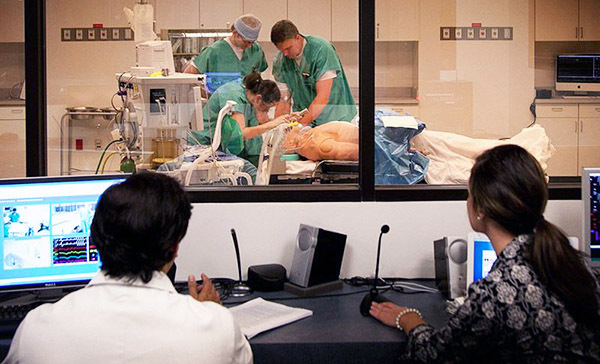 A task trainer, or a faculty member, would use mannequins and other resources to demonstrate certain concepts or ideas to students. It's an approach that was more than viable in the era it was created, but is not necessarily the most effective use of millions of dollars' worth of equipment, space, and people. Equally complicating the matter is that the courses we offer are not as simple as a pass/fail situation. One example of this is our EMT (Emergency Medical Transfer) course, which is required in order to sit for the licensing exam to become an EMT. The course is not only a stepping stone in one’s career, but is also an important part in ensuring future lives are saved. For our EMT courses in particular, we realized a change was necessary to bring the simulations into the modern era. A big part of this evolution came down to the environment itself. Our center was not built to mimic the space an EMT would face in the real world. Often times, this means the back of an ambulance. Obviously, the back of an ambulance is a tight, restricting area. While the material of our courses was terrific, the ambulance simulation took place in a large simulation room. This hardly created a realistic training experience. Our students needed to feel the pressure from the confines of their future environment. We began our search for a viable solution. Some simulation centers will have a decommissioned ambulance inside their space, but this option simply wouldn’t work because our facilities are located on the third floor. Even if we found a way to get the ambulance up there, it would take up too much space. When we were done with the exercise, it’s not like we could just roll it into the closet. My colleagues and I soon reached the point where we simply did not think a solution existed. We thought we had to make due with our current space. Luckily, I paid a visit to the Chelsea-Westminster Hospital for a different research project and stumbled upon a solution. At Chelsea-Westminster, I noticed they found a unique solution to creating simulation ambulance training in a corner of their lab and got them to pull it out. They had retractable screens set up that looked exactly like a real ambulance, and, more importantly, mimicked their restrictive behaviour. My only reaction was to ask, “What is that and where did you buy it?” They told me the solution was called KwickScreen. They demoed the KwickScreen product, named the 'Simbulance', and I instantly realized it was exactly what we needed. I loved the portability, the flexibility, the ease-of-use, and how realistic it looked. After having all but given up on the idea of a solution, it was a huge relief. Even though KwickScreen's Simbulance seemed ideal, I went back and looked at other options to make sure we got the perfect fit. We checked out a competitor’s solution, but it just didn’t meet our needs. It looked realistic enough, but it didn’t retract into itself—they were just stationary walls. KwickScreen’s ability to stow away made it the best option. Since KwickScreen specializes in the medical industry, everything we needed was immediately ready without the requirement for customizations. While I’m sure we could have asked for tweaks, the imagery and size were already perfect. Once we implemented the KwickScreen Simbulance, students loved it right away. It legitimately got them excited, with many of the students taking pictures for social media. But we purchased from KwickScreen for more than just looks—it was also about developing working constraints for students. With KwickScreen's Simbulance, we turned our 400 square foot room into a 40 square foot space for training. This immersive experience mimics the tight quarters of an ambulance, which means students learn how to navigate a tiny space. We’ve now combined our effective training with the right conditions. We originally rolled out KwickScreen's Simbulance exclusively with our summer group, but now it's used in all of our basic EMT courses. Students come twice a week for 15 weeks, usually for about 10–12 nights throughout a semester. Using KwickScreen has been so successful that I'm even starting to visualize other opportunities in which we can use their products across our organization. Tulane has a robust trauma training program, for example. It's currently one of the top in the entire country. A major focus has always been on developing the pre-hospital portion of our education. For traumatic injuries in particular, the paramedic’s role is critical—they’re the first line of defence. The Sim Center has always done our part to make that vital training as dynamic as possible. KwickScreen's products, including its other retractable simulation screens, could play a big part in improving that sim training. But what excites me in the near future is how KwickScreen will captivate the local high school students we work with every year. In January, we run what we call "A Day with Doc." It's aimed at kids from rural schools who have been identified as having an interest in healthcare. They come to Tulane for the whole day and get to spend time in the medical school. It provides them with real insights into different healthcare careers to help inspire their career path. Since KwickScreen creates a fun, realistic environment that excites students, we hope it will spark the same interest in these kids. It could help put us in a better position to create the next generation of healthcare workers. The level of training we offered in our simulation center was good, but it needed to be something more. KwickScreen's Simbulance gave us that extra layer of authenticity our students deserved. Our students and staff are grateful for the changes. And I have no doubt their future patients will be grateful as well.